Game of Gnomes, “it’s the eco-gnomey, stupid”, the Garden Party … we’ve been working through more puns than you can point a rake at for new client, B&Q. As election fever grips the nation, we wanted to make sure some of the less vocal groups were heard. Today we unveiled The Garden Party. 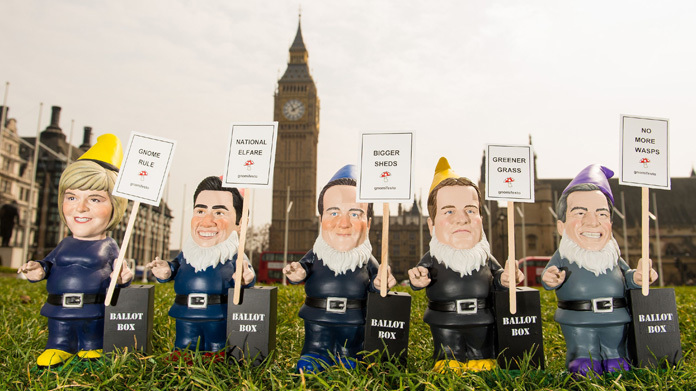 A small party led by the B&Q political garden gnome range (a familiar looking bunch). Campaigning to win the hearts and minds of nations gardeners we sent our little friends around the UK as they competed to lead our party. Apart from dancing (see the video below), our heroes will be collecting a Gnomifesto and campaigning for an end to hay fever, BBQ’s every night, greener lawns and a reduction in wasps. Media have already been lapping these rosy-cheeked characters up and the coverage has been pretty cracking with print pieces in the nationals (including the Daily Mirror, The Sun, METRO and Daily Express) and some belters across the onlines, with just some of the highlights including the Evening Standard, Daily Mirror, Daily Express, Daily Mail, Aol., Daily Record, Belfast Telegraph, Sunday World and even the BBC’s politics Live Blog. While we have ‘gnome’ way to know who will be victorious for the battle of Britain’s green lawns we know that with our help the sheds of Great Britain will be safe and fences will now be unlikely to blow down in the wind.